Complete pallet racks take the hassle out of ordering rack. We've combined easy-to-buy and easy-to-specify starter and adder units together so you can quickly define your size & capacity, and order the starter and adder units you want—buy a single starter kit and connect as many adders as desired to create a row of racks. These racks are sized specifically for 8' wide particle board decks for hand stacked storage and inventory. Do not use a forklift to load or unload. 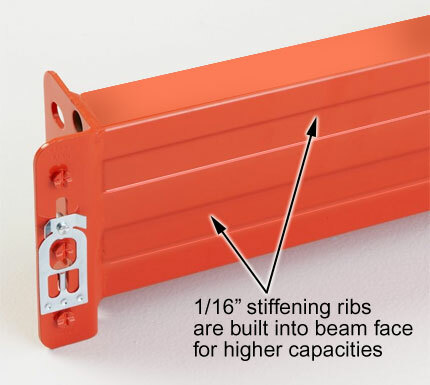 Width x Depth: 96.25" x 36"
1/16" stiffening ribs built into the beam face give you higher capacities. All beams are constructed of high-strength (60,000 p.s.i. minimum) steel. 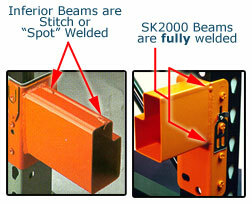 Steel King safety locks are an integral component of the beam. They are not shipped separately, reducing risk of loss or misplacement. Many new rack buyers opt for the SK2000-style tubular design, and users of existing open back (roll formed) boltless rack replace damaged upright frames with new SK2000 frames to lessen impact dangers and eliminate maintenance costs. Because SK2000 uses "tear drop" connections, these users are able to upgrade while reusing their existing load beams. 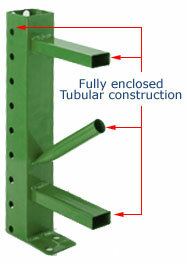 Welds between braces and column are full fillet welds, providing more strength than spot-welds on other rack systems. Multiple offset anchor holes on footpad allow for re-anchoring in cases where rebar interferes with anchoring. All SK2000 storage rack products are certified RMI 1997; confirming that it abides by the most stringent safety procedures. This means that the rack meets or exceeds industry safety standards; that it met an independent review and certification of manufacturer load tables; is compliant to a Global standard, and complies to the default standard for 2000 IBC. Total capacity listed requires an evenly distributed load and 60 inches of spacing between each beam level. Adding or subtracting beam levels from the configuration as shown will alter that capacity. Contact us if you have questions or concerns regarding this issue or any others, we'll be glad to help. 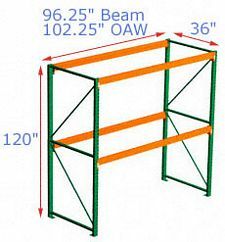 Wire Rack Deck, 36 x 46, 2" x 4" mesh, 3 channels - 3200 lbs. cap.